The weather finally seems to have improved, at least for the time being. Now that I can go outside and actually spend some time there, I took a count of the birds nesting in our yard and there are nine, yes nine, different species of birds nesting in our yard. In alphabetical order they are: Brewer's Blackbird, Brown Headed Cowbird, Chipping Sparrow, House Sparrow, House Wren, Purple Martin, Robin, Tree Swallow and Yellow Warbler. Although, the Cowbird is a parasite and does not nest at all, I spotted several females searching through the shrubbery looking for other birds' nests to lay their eggs in. I, therefore, included it in the list. In addition to the one's actually nesting in our yard, there are at least five others nesting within 100 metres of our yard. They are: Common Grackle, Gray Catbird, Killdeer, Mourning Dove and Pine Siskin. There easily could be others such as Purple Finch, House Finch and Barn Swallow. 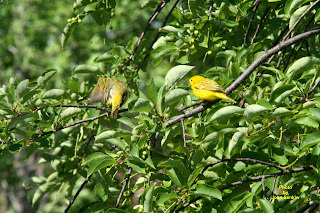 This week I am covering the most common wood warbler in Canada, the Yellow Warbler. At the moment a pair is nesting in our clematis vines along the house. They sure are busy. Several times there has been a flurry of excitement when a female Cowbird showed up. The warblers attacked and chased the Cowbird away. However there are times when the warblers are away from the nest providing an opportunity for the Cowbird to slip in and lay her egg for the warblers to hatch and raise her young. 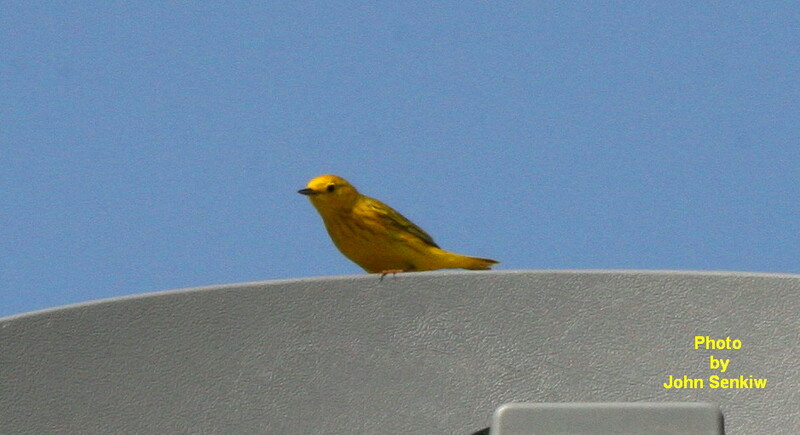 Yellow Warblers will seldom rear a Cowbird. Rather, they simply build another nest right over top of the old one, eggs and all. Growing up on the farm, I used to go around to small birds' nests and throw out the Cowbirds' eggs. I do not know if the parasitized birds appreciated my efforts or not. Also, if a Yellow Warbler's nest is disturbed, the warblers will abandon the nest and build a new one elsewhere. This is not at all uncommon among birds in general, but what is unusual is that the Yellow Warbler will dismantle the old nest and use the material to build the new one. What is even more remarkable is this is accomplished within a couple of days. This is exactly what happened the last time the warblers built a nest in our yard. The nest was in a cranberry too close to the BBQ and the constant disturbance forced them to leave, nest and all. The majority of warblers have at least some yellow on them but only the Yellow Warbler is literally all yellow leading it to be erroneously called a Canary sometimes. The males have been described as a lemon with wings. The male also has quite noticeable red striping on its breast. The female is a much subdued version of the male. The breast and belly are a dull yellow while the top side is a dull yellowish green. There are many warblers that can be seen in one's yard, but the Yellow is the only one that seems to like being in close proximity to man to the point that it will even nest there. For example, this year a pair of Yellow Warblers have built a nest in the vines that are just outside our bedroom window. Not only do they provide enjoyment during the day but the birdsong in the morning is pleasant to wake up to. This week's pictures were taken of the nesting pair that I have just covered. One photo is of the pair sunning themselves in the morning with the female preening herself and the male "standing guard". The other picture is of the male on our satellite dish defending his territory against other intruding male Yellow Warblers. Several times we observed two males fighting in elfin fury with one finally giving in and fleeing. I never was able to figure out whether the intruder won or not. On a cold, damp and dreary day on May 26, I had the pleasure of guiding a group of birders from the Yellowhead Flyway Birding Trail Association (YFBTA), centred out of Saltcoats, to some birding hotspots around Foam Lake. The main thrust was to go birding at the Foam Lake Marsh, however, because of the very wet spring and the reconstruction of highway 310, roads to the marsh were impassable. This was unfortunate as the marsh is an internationally acclaimed site renown as a staging area for migrating waterfowl. Instead, we went to various local places and still had a very successful outing. Our highlight occurred at what locals call the Fedak Slough located along the Yellowhead Highway just across from the Margo grid. This is one of my favourite birding hotspots and many of my pictures of water and marsh birds have been taken there. The said highlight was the sighting of an American Bittern. 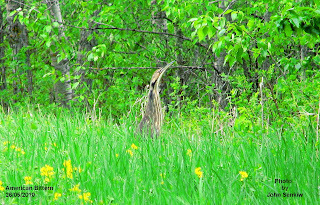 Usually one sees a Bittern in a marsh, but this one was in a grassy area covered with Golden Peas (Buffalo Beans to us old timers) along side a road. It stood in its classic pose with neck outstretched and bill pointed skyward in order to camouflage itself. This pose works well in a reedy marsh but not so much in a grassy flat. To top it off, it was very cooperative and let us approach it up close making it possible to take many good pictures, one of which is included in this article. The Bittern is a long legged chicken sized bird wading bird that is a member of the heron family. The only two other herons one could reasonably expect to see around here are the same sized Black Crowned Night Heron and the much larger Great Blue Heron. Both are quite common in any given year. The male and female Bittern, like all herons, are the same. 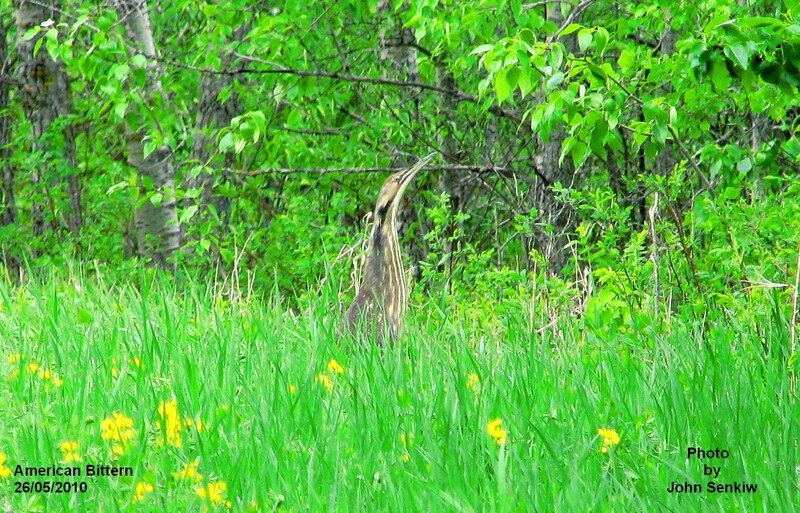 Prior to the 1970s the Bittern was very common when suddenly its population started to decline dramatically across North America. Every evening and night all summer long one could hear the strange hollow pumping sounds of "oonk a choonk" repeated up to seven times followed by a brief break only to be repeated again. This vocalization gave rise to several nicknames such as Thunder Pump and Slough Pump. The very wet 1950s (much like now - at least where I grew up) were paradise years for water birds including Bitterns. Who knows? Maybe with the present wet weather their numbers will rebound. At the same time as the Bittern populations started to decline the frog and toad populations suddenly crashed world wide. It appears there is some sort of fungal disease that is killing amphibians indiscriminately. Are the two events connected? After all, the Bittern's main food source is frogs. Incidentally, I just saw my first frog in our yard since I don't know when. When I was growing up on the farm the chorus of frogs and toads at night was almost deafening, and our yard was literally hopping with them. I have seen the odd frog here and there, but I have not seen a toad in years. Hopefully the two, along with the bittern will recover. I have not heard a Bittern's "pumping " since the 1960s. Too bad. Maybe, just maybe, I might hear it again someday soon. It appears that we are finally going to get some sunny weather. It is a little late to do much good for farmers this year but perhaps it will help in some way next year. As difficult as this weather has been for humans, the luxuriant plant growth and abundant insect life has been a bonanza for birds of all stripes. Food, water, shelter and nesting sites abound. This year our yard has been particularly active with more birds and more species than usual. In article No. 78 from Texas, I discussed a group of birds called mimids focussing on thrashers. Mimids are so called because they like to mimic sounds that they hear around them. In reality, only one mimid, the Mocking Bird, does so to any great extent. 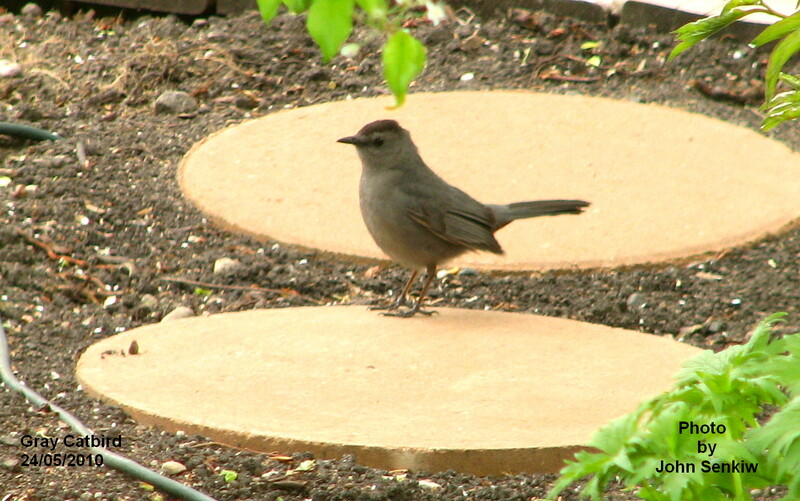 Another one, the Gray Catbird, will mimic other bird sounds occasionally but not often nor well. There are four mimids that occur in Saskatchewan. Two, the Gray Catbird and Brown Thrasher, are common; one, the Sage Thrasher, is found in only one place in a sage flat near the American border south of the Cypress Hills; the Mockingbird, a very rare vagrant, can occur just about anywhere. In this article I want to cover the only mimid that can be expected in our yards around here - the Gray Catbird or simply Catbird. It is an even dark grey overall with a black cap, chestnut under tail coverts and beady black eyes. In size, it ranges about midway between a sparrow and a Robin. In flight the long tailed body exhibits a slight sinuous motion (the body moves somewhat like a crawling worm) that usually only Cuckoos exhibit. The easiest way to identify the bird even before it is seen is by its distress sound - a kitten like mewing after which the bird is named. This is its way of sounding an alarm that an intruder is nearby. As youngsters we knew we were near a nest when we heard the mewing sound. Incidentally, the nest is in thickets fairly low to the ground and the eggs are bright blue like a Robin's. When angry the Catbird scolds with a rather harsh squawking/screeching sound. Two years ago when I was picking pincherries in our yard, a catbird did not like what I was doing and proceeded to "chew me out" from only a metre or so away. About fifteen minutes later it gave up, thankfully, and left. During mating season, the male will sit on an exposed perch and sing a pleasant song quite similar to that of a Robin. 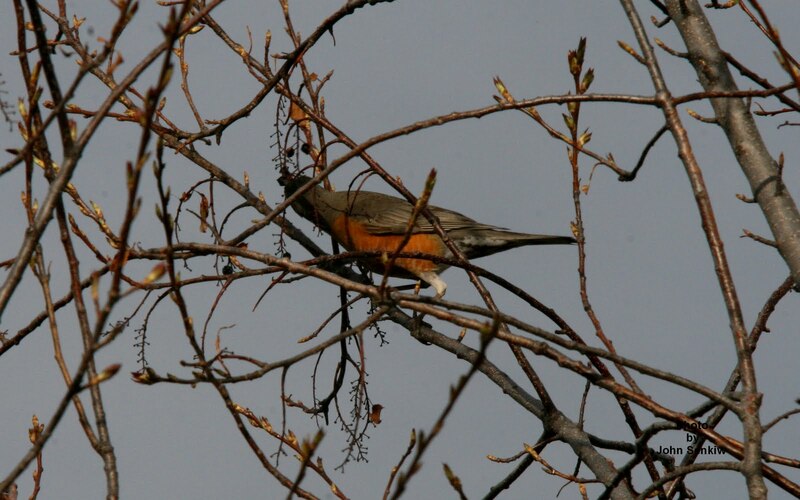 I have heard this song since childhood, therefore, I do not believe the Catbird was mimicking a Robin. This week's picture was taken this spring in our backyard. The bird has been around all spring warning, scolding and singing in our and our neighbours' yards. It must be nesting somewhere nearby. Will the rain never stop? It seems that the sun barely comes up before we are deluged again. Shades of the mid 1950s. The constant rains are not good news for farmers but the grass, trees and shrubs are luxuriant. The birds, especially waterfowl, are thriving. This week I will finally finish the last article on attracting birds to our yards. 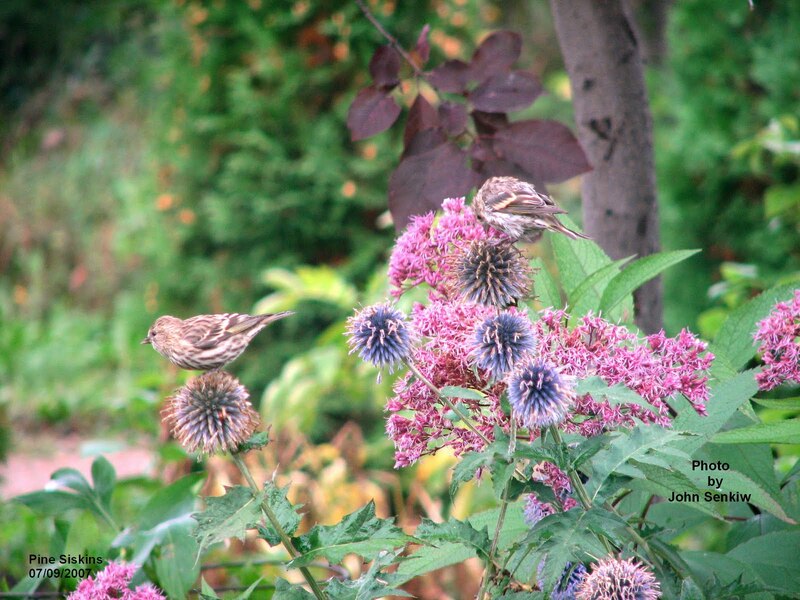 As much as food and water can and do attract birds, appropriate plantings of grasses, flowers, shrubs and trees can dramatically increase the numbers of birds visiting one's yard. 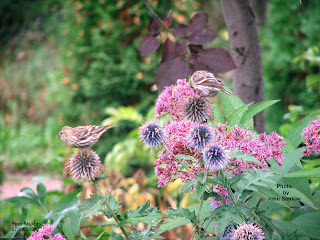 If and when the decision is made to attract birds with plants then three basic questions have to be considered: how many plants, what kinds of plants and where should they be planted. Also, two different kinds of yards have to be taken into consideration - farm and urban. What works for one will work for the other with one major difference - farms are bigger. Farm yards have a more or less unlimited area whereas town yards are quite restricted. A farmstead built on an open field and then surrounded by a perimeter of trees does provide shelter but does not really attract wildlife to any degree. Farm yards with a few acres of natural bush, enhanced by plantings, near buildings really shine. This arrangement attracts not only more birds, but a greater variety of species that would not normally be seen otherwise. In urban areas space is limited and plants have to be chosen carefully. How many plants should one plant? There is no magic number, but most yards could easily sustain more plants than they usually do. It does take more work, though. Large expanses of lawn studded with a few large trees have a lot of appeal to humans but offer very little for birds. Gardens, including fields, are a little better than lawns but not much. Something else is needed. Because of our history of European immigration, many of our decorative plants such a lilac, carragana, cotoneaster and Siberian Elm are imports. Native species were not only ignored but removed and replaced with the foreign ones. However, many of our small native fruit trees such as chokecherry, pincherry, saskatoon, hawthorne and highbush cranberry are not only as attractive as the foreign ones but provide nesting sites and food for birds (and man) as well. In Europe, forests have much less undergrowth than the forests in the Americas, and this "ideal" has been carried over from Europe to the new world where it has stuck and stubbornly refused to die. To this day most people treat underbrush as weeds and eliminate it whenever possible preferring large show trees with little or no undergrowth. Incidentally, the word "underbrush" was coined in the new world to describe something that did not exist in the old world - dense undergrowth. In addition to woody plants, domesticated varieties of annuals, perennials and grasses should be included in one's yard plans. How does one achieve this? It is completely unrealistic to expect somebody to cover the whole yard with trees and brush without gardens and lawns. Birds and people have to coexist; lawns will be maintained and gardens will be planted. However, around the outside edges of yards and along buildings there usually are so called 'dead spots". Small fruit bearing trees and shrubs, such as currants, can be planted here. If at all possible, shrubbery should be planted as thickly as possible to form thickets which our North American birds must have if they are to breed. Examples of a few such birds are Cedar Waxwings, sparrows, warblers and wrens. To cover a topic of this nature thoroughly would require a small magazine, so this article has been an overview only. For a more thorough discussion check with the Canadian Wildlife Federation and related organizations. 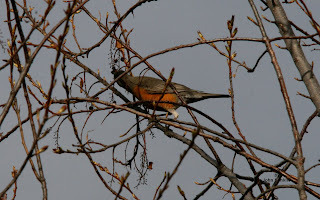 This week's photos are of a robin eating overwintering chokecherries this spring and of a pair of Pine Siskins feeding on Joe Pye Weed (domesticated milkweed) and domestic thistle last August. If nothing else, they do make nice pictures. Last week I implied that I would write the last article in a series about attracting birds to one's back yard. However, the weather, bad as it was, made me change my mind. Rather, I will segue from last week's article into this week's by writing about orioles instead. The orioles seem to be late in arriving so feeding them now might be timely. There are eight species of orioles in North America, five of which are common to the USA and three to Canada. The common one in Saskatchewan is the Baltimore Oriole which is about halfway between a sparrow and robin in size. This striking orange bird with black head, back, tail and wings is named after one of North America's first British colonizers, Lord Baltimore, whose titular colours were orange and black. The common oriole of the Rocky Mountain region is the Bullock's Oriole, a close relative of the Baltimore Oriole. Both are very similar with the major difference being that the Bullock's black head has an orange face with a black line through the eye, while the Baltimore's head is all black. The two orioles also have slightly different vocalizations. For those of you who have older bird books, take note that these two orioles were previously lumped into one species, the Northern Oriole. Interestingly, these birds had previously been split, then combined, and then recently split into two species again. Do not be surprised if the two are recombined. The third oriole, the Orchard Oriole, is like a slender version of the Baltimore except that the orange is replaced by a brick red/chestnut colour. The reddish colour does not stand out and in poor light the bird looks all dark much like a blackbird. 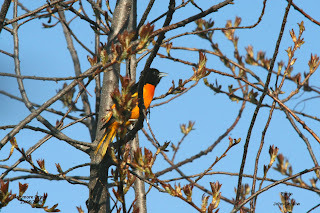 The Orchard oriole is very common in southern Ontario and adjacent areas. Like all orioles, the females are much duller version of the males. Orioles are the most colourful members of the blackbird family usually being orange and black although the orange is sometimes replaced by yellow, as in the Scot's Oriole pictured last week. 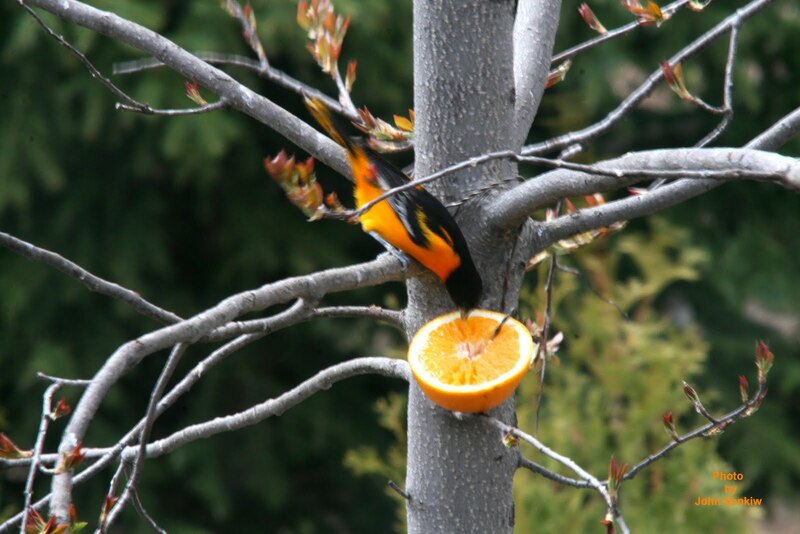 Other than their bright colours, orioles are known for building their pendulous basketlike nests high in mature trees. 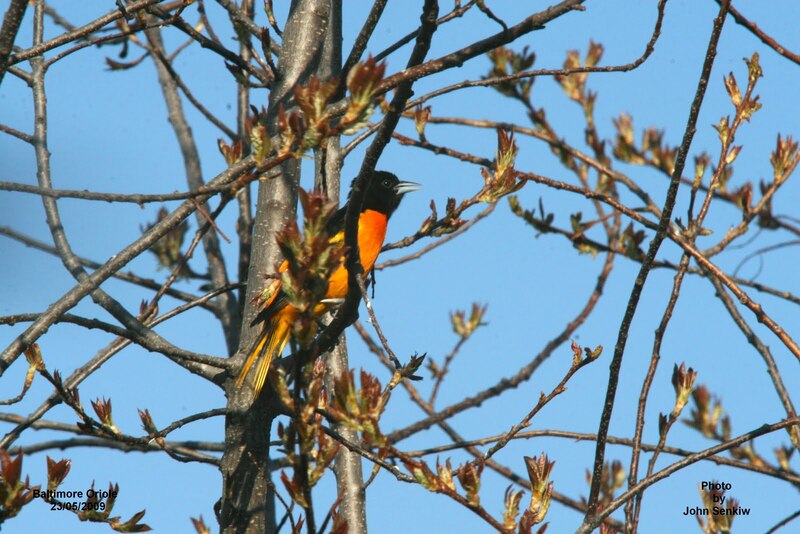 Some orioles build nests several feet long although the Baltimore's nest is only about six inches deep. As kids we used to get a kick out of hanging out short pieces of coloured yarn for the orioles to use in nest building. We were never disappointed and the nests were colourful to say the least, and easy to find. We would then climb, very carefully, to these high altitude nests to peek inside and look at the white eggs streaked randomly with fine brown lines. Orioles will nest near people but they must have tall mature trees. This week's pictures show a male Baltimore Oriole in our backyard. Like the lemon yellow Scot's Oriole featured last week, the orange Baltimore Oriole also likes grapefruit and grape jelly. However, there is only about a three week window in the spring in which to attract these birds after which nesting starts and the orioles stay away. I have not seen any orioles this year, yet, but hopefully my grapefruits attract them. Join the JohnTheBirder Group to get my posts via email. Residing in Foam Lake, Saskatchewan; John has been an avid bird watcher for more than 60 years. Thank you for stopping by and we hope you enjoy JohnTheBirder.com!